(Sleazy Records) 3-Track EP - 45 rpm, large inner hole, with picture cover and inner sleeve! 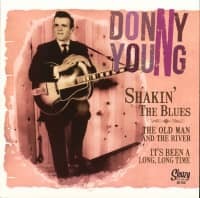 Original Decca recordings 1958-1960, when Johnny Paycheck was Donny Young! 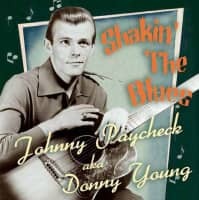 "Johnny Paycheck aka Donny Young"
Much ado has been made of 'the early years' of the artist known as Johnny Paycheck. In recent times several excellent compilations of his Little Darlin' label recordings have been made available, which has been a blessing for collectors and new fans alike. However, everything that has been written about the man born Donald Eugene Lytle seems to suggest that one day in 1964, he emerged perfectly hatched as country superstar Johnny Paycheck. Only a few of the bios mention in passing that he had made a few failed records early on under the guise of Donny Young, and even then only as if this was an unpleasant factoid to be swept under the rug and forgotten. The fact that these records did not sell—truthfully, that they could not even be given away—fails to diminish the excitement that these records, listened to with fresh ears some 45 years down the road, will offer. They are great records, great songs, and great productions. Nashville, then as now, only recognizes financial success, and these records were flops, therefore they must have been terrible records, according to the Nashville standard. Nobody bought Cadillacs from these discs, and the name Donny Young draws a blank stare from all but the most astute music historians. However, the failure of these discs was more likely to be blamed on the uncontrollable, ornery, drugging and drinking young man who sang them, and on the lack of promotion on the part of the record labels, rather than any lack of musical greatness. The greatness was there, fully intact, it would just take a name change, a smart manager, and the advent of 'outlaw country' before the Cadillacs would come, and the respect of the country music establishment with it. Donald Eugene Lytle was born May 31, 1938 in Greenfield, Ohio, an unlikely place for a future country star to hail from, but not entirely out of character. Outside of Cleveland, Columbus and Cincinnati, Ohio was a myriad of one hick town after another, and country music had always been king. The great radio powerhouse WLW had broadcast out of Cincinnati, bringing the sounds of country music to towns like Greenfield, and of course WSM and the Grand Ole Opry were well within broadcast range as well. The giant record label King was based out of Cincinnati, releasing hundreds of budget country albums; and the Jimmie Skinner Record Shop, also based out of Cincy, would distribute millions of those country discs to rural areas like Greenfield and every little hick town in a thousand mile radius. When asked about his early years, Paycheck remembered his mother having Hank Williams 78rpm records in their house, and reckoned that Hank was his biggest influence. His mother gave the lad a guitar at the age of six, and promptly began entering him in talent contests in the nearby area at the age of nine. By the age of thirteen he was working steady as a professional singer at Paul Angel's Club 28 in Greenfield. Not content with local stability, Paycheck began drifting early on—hopping a freight train at the age of fifteen and traveling to all the cities in the tri-state area. Wherever he would land, he would get a job as a singer at a local honky-tonk, and worked at many of the top country nightclubs in the state of Ohio before making the big decision to join the Navy. It's hard to imagine anyone less suited for the rigors of military life than Johnny Paycheck, and sure enough within a few months Paycheck had been court-martialed and put in the brig for fracturing an officer's skull during a brawl. In 1956 he was sentenced to hard time for the offense, and began serving time at a military prison in Portsmouth, New Hampshire. 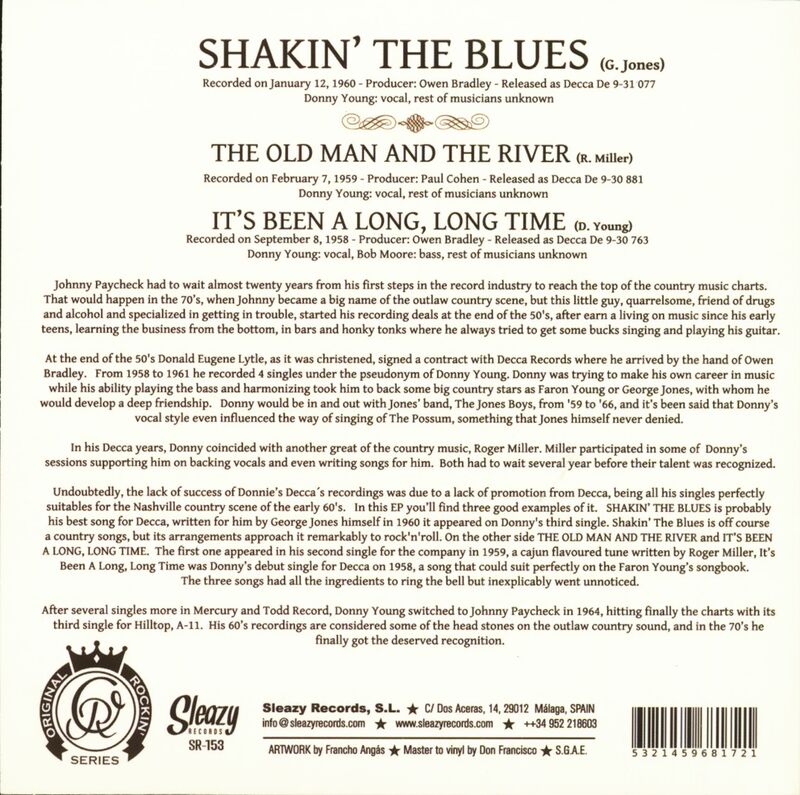 Customer evaluation for "Shakin' The Blues (7inch, EP, 45rpm, PS)"